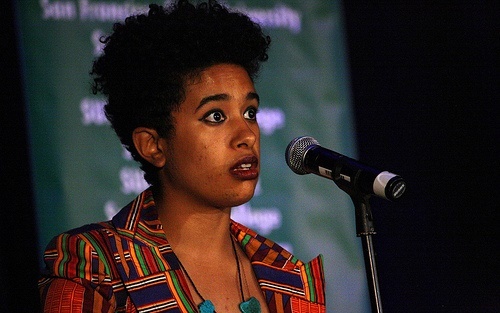 Aziza Barnes is a ‘brown woman poet’ from Los Angeles, currently living in New York. She attended Tisch School of the Arts at New York University, pursuing her BFA in theater, creative writing and Africana Studies. She was a member of NYU’s poetry slam teams in 2011 and 2012, winning first place in the nation. A member of the Dance Cartel, Aziza performs in venues around New York and is finishing a residency at the Ace Hotel. She is a co-founder of the Divine Fabrics Collective. Winner of the 2012 Button Poetry Prize and author of me Aunt Jemima and the nailgun.